Una Mamma Italiana: Gabriella's Onomastico! Today marked a popular Feast Day for many Italians - the feast of the Annunciation, or L'Annunciazione! 1. It's Friday night and the sugar buzz will not be so lethal on a non-school night. Since our kids were babies, we would celebrate these 'excuses for cake during Lent'........ahem, I mean - special feast days.....to try and teach the kids a little bit about their culture & religion. (we all give up sweets for Lent - it's my husband's way of dieting) Now that the kids are really starting to understand the meaning behind it all, it's tons more fun. When I asked if her class enjoyed them, she paraphrased, "Oh, Mamma - everyone in the class wanted my cupcakes soooo bad. I opened them in the morning and I wanted them all day but I waited until lunch and then Sister handed them out because I would have spilled." I was looking for a simple, "yes" and "thank you" but hey, that works. 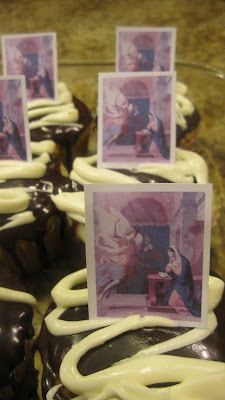 Each little picture is a scene of the Annunciation that I printed off from my computer (in t-2 seconds), cut out, and taped to toothpicks - super simple. So if you don't do it already, find a way to incorporate these types of feast days into your calendar. It's a terrific way to teach the kids a little something with meaning behind it, and a greaaat excuse for cake:) Cheers!